all these turn of events got me all shook! I read book 1 and this sequel back-to-back. This book was just as good as the first one -- meaning, NOT awesome, but NOT bad ;) I feel like this series is so close to being something really good though, so I'll probably keep on going and read the next one. Well... that ending was intense. 3.5Less predictable than the first, with a nice twist in the epilogue. People still far too often failed to listen to good advice (Dara didn't listen to her *own*). I haven't got around to reading the third, but will at some point. I like the premise of this series, it makes me continue reading it despite its shortcomings. This was a great book too however i hated that their was secrets with Dara. When you realized that you read the first book with perfect timing to get the second one immediately after that one...Then immediately after you finish the second book you realize that there is a third....And the second book's release was this year...With such an awesome adventure ahead I am surely sitting on pins and needles. The Steel and Fire series has it's flaws, but it's also enjoyable in it's own right. While some of the modern terms can throw me off, I believe Rivet has something interesting on her hands. Kudos to the steady character development as well. Siv, although he is still... well-- Siv, is becoming more mature. I also appreciate the layers added to Dara's character, torn between loyalty to a young king and wanting to believe the best in her family. King of Mist (Steel and Fire - book 2) was every bit as good as Duel of Fire (book 1). Typically, I don't read YA Fantasy, but the characters are so engaging and the plot so thrilling, that I'm completely hooked on this series. This book is a real page turner and I couldn't recommend it more. I think my biggest disappointment about these books is the small, minuscule role the cur-dragons actually play. That bummed me out so much, okay? Just WOW! !This book was even more awesome than the first one. How come I've never heard of this amazing author before?King of mist is so full of action and suspense that you will find yourself without any fingernails in the last chapter. I bit mine off already in the first chapter;)The friendship takes a bad turn between Dara and king Siv after what happened in the first book. I found myself yelling at them both for being so darn stubborn and full of pride. They should try and work out their issues instead. Although I completely understand Siv's reaction to many of the things that happened to him in this book. I found myself questioning a lot of Dara's decisions in this book and I don't agree with her on a lot but I can't wait to see how they solve everything in the next-coming books.I still have some troubles understanding exactly how the fire system works but that's the only negative thing I can find about this book!The ending was so great and I'm sure I got whiplash injuries from all the twist and turns that I did not see coming.Seriously, you should read this series. You will not regret it!! This is book two in this series and it was very good. I appreciate the character development. You just have to cheer for Siv and hope he can figure out how to be king with all of the political maneuvering going on. Dara continues to be a strong reliable friend, but thinks often of wanting more even if she knows it can't be. Will Dara figure out how to please her parents? Will she be able to atone for what they have done and get them to see that Siv is a good king? This book ends with things rather precarious and Dara and Siv trying to stay alive. I am anxious to read the next one. This was a really good sequel to Duel of Fire. I really like both Siv and Dara as well as many of the supporting characters. This book was filled with intrigue and action and an underlying romance. My only criticism would be that sometimes the action and swordplay went on rather long and I was trying to read really fast -- even though it was interesting and well written. Ultimately I'm definitely moving on to book three. Honestly, I was riveted.This is turning out to be a very nicely woven story, tightly worked and well thought-out. Realistic character development, excellent political intrigue, great world-building. The pacing was excellent, the action was enticing, and the writing itself was highly engaging.I am now ready to devour Book Three! Another enjoyable book in this series. I'm willing to stick with it and see where this adventure leads me so I purchased the third book for my kindle. Now on to book three with more added adventure. 4 starsThis would have been 5 stars except that it was slow in places, in part because of repeating descriptions or scene building. However, the characters are as charming as book 1 and the court intrigue just as captivating. The political unreality of the story finally got to me, making it impossible to finish. We know who murdered the king? Don't bother arresting them. We know who is plotting a coup? Ignore them. We know which member of the army staff are disloyal? We won't fire them. Well, I was right in thinking that this series would only get better. So much tension. So much DRAMA. So many FEEEEEEEEELS. Still enjoying this trilogy. We will see how this all wraps up. Fun YA book- not as good as the first but I enjoyed it for the audience. Still continuing at a moderately good pace of adequate. Reviewed at my blog: Babbling BooksAs a sequel this book is actually my favorite in the entire series. It kicks the action into high gear and that ending is just spectacular. All of the twists and the battle are just beyond perfectly executed. The development of Siv and Dara's relationship is great in this book and gives just enough of a push forward for them to keep the reader interested as they go into the next few books. And I was happy to see that the secondary characters got development as well, like Vine who is quickly becoming a favorite too. With each book I feel more immersed in this world and am more interested in what's going on with the characters. The magic gets more in-depth and intriguing and I'm fascinated learning about the political workings of the societies. Love this series. Couldn't put it down. I actually really enjoyed the storyline, but I just finished this book and the first, and the writing just seems to be so simple, like 'there it was.' Maybe I'm expecting too much flourish, but I'd rather read something a bit more complex.The concept behind the characters and the magic is pretty cool. If you've ever seen Avatar the Last Airbender, you know what I'm talking about. Our main character is the daughter of a Firewielder (bender) who's dedicated her life to dueling in their peaceful kingdom. People don't need actual sharpened weapons, or know how to fatally strike, but all that changes after Prince Siv was attacked and craziness ensues. The kingdom is no longer peaceful and now our heroine Dara is thrust into another role, a Castle Guard. She has to deal with her growing feelings for Siv and her crappy relationship with her parents, as well as suspicions of them and other characters in play. The book ends on an almost cliffhanger, but there is a bit more character development as we go along. Of course, there are strong points and weak points for each person all throughout the book, as well as the issues they have to deal with, but I'd rather kind of feel it, rather than read a line that says, 'she was conflicted' or it was 'so scary' and whatnot. Anyways, reading for the storyline, bearing with the writing. Looking forward to the last book. This second installment of the series did not disappoint. We know Dara is strong from reading the first story, but in this novel, her character is developed thoroughly. She has found a purpose apart from dueling, and we see her struggle with duty and matters of the heart. Siv also has growth in this book, and we see him mature from an impulsive, somewhat obnoxious character, into a young man who is doing his best to be kingly. I believe I liked his portrayal more in this story than the first, mainly because there is some angst when Siv realizes his heart and head do not agree on the right course of action. I enjoyed the first novel, however, there is a more definite sense of urgency and danger in this book that sets it apart from its predecessor. The villains have a name, face, and motive in "King of Mist," making it highly addictive. I recommend this series to fans of GoT, Eragon, and Percy Jackson. After the promising start of Steel and Fire, the second book comes as a slight disappointment. Don't get me wrong, there was nothing in it that I hated or disliked strongly but there was also nothing that I loved. My investment in the main characters (and their sure romance) lessened and the plot felt too slow paced in the beginning and then packed full at the end. 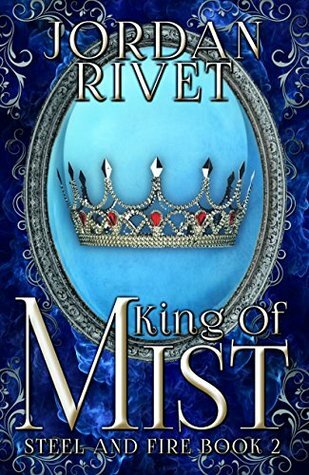 With Steel and Fire being the base of the whole series I expected King of Mist to be more. More of everything. It's hard to explain. The only way I can describe it is that I had hopes for something better. I do hope that the next on will be better! I was very disappointed with this book. (view spoiler)[Once Dara made it clear that she would protect her parents by not telling the prince that they killed his father I had to put the book down in disgust. I get why the author did it this way, Dara is acting in a way that fits with the human psyche. She loves her parents despite their faults, and she is also upset about what happened with her sister. But from an outside perspective these actions makes me lose faith in humanity and I would just rather not read about it. (hide spoiler)] I did skim the book to find out what happens, and although it seems like it did eventually redeem itself unfortunately I just lost interest. Pure enjoyment This book was even better than the first. It's full of dueling action, espionage, and the kisses if a budding romance. The whole of this book revolves around Siv trying to find his place as King and Dara trying to unfold plots against the king while honing her Fire skills. This novel was fast paced, easy to read, exciting and full of lovable characters. It will definitely be on my list to follow for sequels. Jordan Rivet - Jordan Rivet is an American author of young adult fantasy and post-apocalyptic adventures. She lives in Hong Kong.Jordan's books include the swashbuckling Steel & Fire fantasy series and The Seabound Chronicles, a post-apocalyptic adventure set on a cruise ship.Her next release is called The Spy in the Silver Palace. It's the first book in the new Empire of Talents series.